The idea of toll-free data is a relatively new one for U.S. mobile customers. T-Mobile(s tmus) in June launched Music Freedom, which exempts streaming music from customers’ mobile data plans. AT&T(s t) has just begun testing free data over the last few months with its controversial sponsored data program, which lets content providers pay their customers mobile data bills. But overseas, toll-free data plans are becoming the norm, according to bandwidth manager Allot Communications(s allt). The company studied the data billing policies of its mobile carrier customers worldwide and found that 49 percent of them offered a plan that exempted certain apps or traffic from customers’ data buckets, a practice known as zero-rating. Of those carriers, 65 percent zero-rated Facebook(s fb), letting their customers peruse and post to their feeds or use Messenger — sometimes both — as much as they like without incurring any data charges. That makes sense given Facebook’s growing global popularity and its relative low data demands compared to, say, a video or audio streaming app. Facebook has also been partnering directly with carriers as part of its Internet.org initiative to make unfettered use of its apps the norm in the developing world. In fact, this kind of app-centric toll-free data plan is proving to be a powerful marketing tool in areas where the mobile data revolution is just taking off, Allot found. Carriers aren’t simply selling buckets of megabytes; they’re selling a mobile lifestyle centered on social media. Instead of losing data revenues by exempting certain types of traffic, carriers are actually bringing in more money per subscriber as consumers are willing to pay more for these options. For instance, in Brazil, Claro offers a social media package that includes unlimited and unrestricted use of Facebook and Twitter(s twtr). In Cameroon, MTN is bundling WhatsApp usage into prepaid plans. 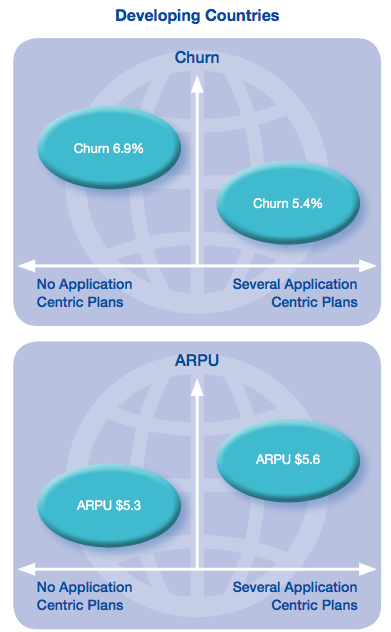 According to Allot, app-driven plans are part of a larger global trend to bundle value-added services into mobile plans. We’ve already seen this in the U.S. with big and small carriers offering everything from music to cloud storage with their service plans, though they aren’t necessarily offered toll-free – at least not yet. We’re likely to see more apps exempt from data charges, and not necessarily just internet content providers paying AT&T to zero-rate their traffic. T-Mobile has gotten wise to the idea that overage-charge fear is inhibiting customers from using more bandwidth-intensive services like streaming, which is why it launched Music Freedom. I wouldn’t be surprised if it and other carriers started extending the same policies to social media apps. Of course, that opens up another can of worms in the net neutrality debate. If carriers start favoring specific apps rather than certain types of traffic, then their customers will naturally gravitate toward those apps. T-Mobile, for instance, isn’t exempting all music streaming apps from its data plans. It’s exempting the six music services it deems most popular.